Note: The following statements have not been evaluated or approved by the FDA. 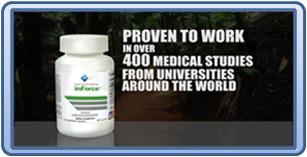 Our product, inForce is sold as a dietary supplement only. It is not sold with the intention to prevent, mitigate or cure any disease. 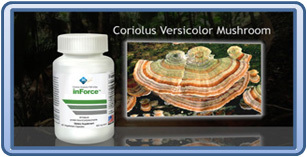 inForce is a proprietary blend of the Coriolus Versicolor mushroom extract. inLife sells this product with PSK & PSP and a more potent strain of PSP. Web MD reports that the Coriolus Versicolor mushroom, PSK & PSP are used for stimulating the immune system: It is suggested that the body's own immune system is a key player in maintaining health and wellness. Web MD also states that the Coriolus mushroom can be used to help increase energy and improve body building results. Traditionally, the Coriolus Versicolor mushroom has been used in China for several thousands of years because of it's immune boosting capabilities. It's recorded usage in history dates back to mid 1300's during the Ming dynasty. In the 1970s researchers in Japan started experimenting with the mushroom by extracting it's essence. The protein bound polysaccharide that was isolated from the mushroom is called Polysaccharide –K (Krestin, PSK). Their research found that PSK is effective as an immune system boosting agent. It is used in some European countries as well as China and in Japan, PSK is prescribed in conjunction with chemotherapy and is covered by their government health insurance. PSK has documented immune boosting activity in vitro, in vivo in human clinical trials. Human clinical trials show PSK can maintain health and wellness. In the 1980's, Chinese researchers conducted further studies and were able to isolate a much more potent strain using a different, alcohol based extraction process. The result was Polysaccharide peptide or PSP. In the United States, top ranked hospital and research institutes have reported that Coriolus Versicolor, PSK and PSP helps boost the body's own immune systems with limited side effects and safety of daily oral doses for extended periods of time." In addition, Coriolus Versicolor and its potential positive effects has been studied very closely by MD Anderson, University of Texas, Loma Linda University, Beth Israel Deaconess Medical Center (a teaching hospital of Harvard Medical School) , The University of San Diego, Sloan-Kettering Center (New York), and Bastyr University (Kenmore, Washington) just to name a few. Worldwide, there have been over 400 animal and human studies on the subject with over a dozen, placebo based human trials conducted in the west. The immune system is the body's ultimate defense against infectious agents. A healthy immune system has the best chance for defending the body against life threatening and/or disease in general. It also protects against genetic mistakes made at the cellular level. With this fact in mind, it only makes sense that we should all be doing everything possible to bolster and strengthen our immune system. The immune system is complex, containing many interacting blood cells, proteins and chemicals. A healthy immune system contains elements that are in balance with one another. But when the immune system is compromised, the results can be deadly. In a compromised immune system, the components are unbalanced and unable to protect the body against harmful agents or processes. The immune system can also be compromised when it is overworked when called upon to fight off multiple battles on several fronts. Western medical doctors seek to bolster immune system activity by providing either chemotherapeutic agents that arrest aggressive cellular growth or with bioengineered molecules that simulate elements of our own immune system. In contrast, traditional medical practitioners use botanicals and other natural substances to stimulate the body's own defense mechanisms rather than substitute for them. What is very interesting about Coriolus Versicolor is that western medical doctors and Western research institutions have been studying it very closely for its immune boosting capabilities. But most people in the west are unaware of Coriolus Versicolor and it was very difficult to find. But in the East, word of mouth has catapulted the sale of this product into the 100's of millions of dollars. Coriolus Versicolor, PSK and PSP is one of the most widely studied supplements for it's immune building properties. One would be hard pressed to find another immune boosting product that has had more research completed or positive comments associated with it. The amount of worldwide comments and studies (including those in the west) is compelling. There have been over 400 animal and human studies worldwide including over a dozen human based, placebo trials. It is also reported that it is good for all people including the elderly, the physically weak and those who are overworked. inLife offers Coriolus Versicolor as a Daily Dietary Supplement in pill form to help maintain and stimulate the body's immune system. Available as inForce and inForce Platinum. inForce is a proprietary blend and offers the best value for the money. It is a combination of both Polysaccharide Krestin (PSK) and Polysaccharide Peptide (PSP). inForce Platinum is a more potent strain of Polysaccharide Peptide (PSP) and is the best potency we offer. Both offer much needed immune building assistance and they can be taken on a daily basis. The products are bottled in the United States in a FDA registered bottling facility that is CGMP compliant (Current Good Manufacturing Practices). Many of our customers and independent distributors ask us about the recommended amount of inForce Immune Builder they should take. 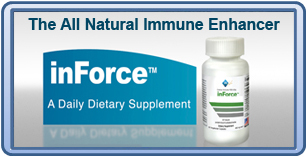 For individuals with a non-compromised immune system, inForce should be taken daily, one capsule - 2 to 3 times a day. We recommend taking the product at least 30 minutes before a meal. inForce Immune builder should be used daily to help support and maintain a healthy immune system. If you feel that your immune system might be compromised for any reason 3 - 4 capsules should be taken - 2 to 3 times a day on an empty stomach. This is based on the usage amounts used in the clinical studies of Corioulus versicolor PSK & PSP and feedback from inForce users and testimonials. This should help to jump start the immune enhancement process and you should see and feel the results of this amazing immune builder in a period of 4 - 6 weeks. ...the most powerful way to bring a product or service to market. Get ready for an explosion. This product is going to change...everything! Important Notice: The information on this site has not been evaluated by the Food and Drug Administration. These products are dietary supplements and are not intended to diagnose, treat, cure or prevent any disease. Additionally, the information presented here is not intended to replace the advice of your health practitioner and/or Doctor. If you believe you are experiencing a medical or health problem, seek the assistance of a qualified health professional immediately. Research studies on Coriolus Versicolor (CV), PSP and PSK were performed by independent doctors, researchers, and research institutions in the U.S., Europe and Asia. These studies were conduced on CV, PSK and PSP and not the product labeled as inForce.